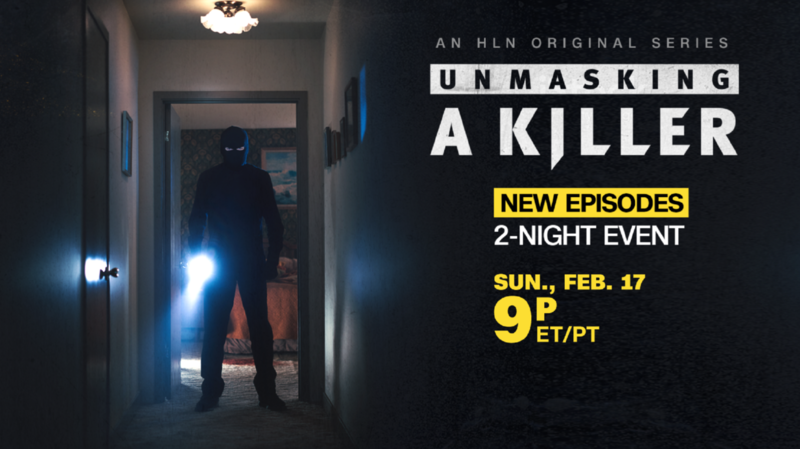 February 5, 2019 – New episodes of the popular HLN Original Series Unmasking A Killer, covering the fascinating events leading to the capture of the suspected Golden State Killer (GSK), will premiere in a two-night event on Sunday, February 17 and Monday February 18, both at 9pm ET/PT. These new episodes follow the highly successful five-part HLN Original Series that aired in March-April 2018, just prior to the suspect’s capture on April 24. A marathon of the first season will re-air on HLN on Sunday, February 17 beginning at 4pm ET and leading up to the 9pm ET premiere of night one of the series finale. Unmasking a Killer is executive produced by Joke Fincioen and Biagio Messina for Joke Productions. The Unmasking A Killer podcast, part of Turner Podcast Network’s portfolio of entertainment, kids, news and sports podcasts, returns with ten new episodes. Hosted by Joke Fincioen and Biagio Messina, the new season of weekly podcasts will examine the defendant’s history and capture. Fans can download the weekly podcast starting February 12 via turner.com/podcast, Apple Podcasts, Spotify, TuneIn and other podcast apps. Marathons of the first season will re-air on HLN on Saturday, February 16 beginning at 6pm ET, and Sunday, February 17 beginning at 4pm ET and leading up to the 9pm ET premiere of night one of the series finale. Viewers can revisit the full first season, currently available On Demand and on CNNgo (at CNN.com/go and via CNNgo apps for Apple TV, Roku, Amazon Fire, Chromecast, Samsung Smart TV and Android TV). The new episodes of Unmasking a Killer will also be available the day after the broadcast premieres on demand via cable/satellite systems, CNNgo platforms and CNN mobile apps. The Turner Podcast Network was created to implement a portfolio-wide network that centralizes production, distribution and sales for all Turner podcasts in order to develop and launch new branded podcasts across Turner’s news, kids and entertainment brands. Turner’s podcasts reach an average monthly audience of over 9 million unique users and 16 million downloads. HLN features live coverage of national, regional, lifestyle, and entertainment stories in a fast-paced approachable tone with expert-led, personality driven hosts by day. Later in the schedule the network presents original and acquired series focusing on true crime, mysteries and investigations. HLN is a CNN Worldwide network reaching more than 90 million households in the U.S. CNN Worldwide, a division of Turner Broadcasting System, Inc., a Warner Media Company, is the most trusted source for news and information.